Many people would go to a school in a rural area and do an one off session and go on social media to spread the word that they have saved the community. While it may yield something for their satisfaction there is no sustainable outcome to the community. Sri Lanka needs reforms in its education system to provide more opportunities for youth to enter the tertiary education. Inspite of what was mentioned above, there are many efforts emerging to assist students to obtain the necessary qualifications to reach the tertiary education.This is one of the examples of a sustainable process that yielded a significant outcome. It is change we all yearn for - that’s how we matter. So we learn - unconsciously and deliberately. We grow, so as our world and knowledge, making us more humble in the process. A kid who fantasises of being the Robin Hood, a vigilante who saved villagers from cruel dominance of Sheriff, would become a Lawyer who fights for the rights of the public - that’s how we find meaning of life - how we establish our existence. But does everyone get the equal opportunity to see the world as we do? AKURU was the project created by myself and fellow colleagues of 2007 A/L batch of Royal College, to try and fill the gap in the quality of education in rural schools. We chose Hinguralakanda Maha Vidyalaya, with help from the Secretary of the Zonal Education Office of Dehiowita. The school had extremely insufficient facilities and unbelievably, had only a single teacher for Mathematics, teaching grades 6 through 11! She has to take 3 buses to reach the school, and missing a bus would mean missing a day at school. The Hinguralakanda village is the stuff of movies. Remote and unspoiled, with the Sitawaka river rumbling along, it shows the true beauty of Sri Lanka. However, it is a hard life for those living in this village - there is no mobile or internet signals and no newspaper delivery - the village is isolated and frozen in time. The students were frightfully unaware of the outside world and their only aspirations were to continue in their fathers’ occupations, which was either plucking coconuts or doing minor carpentry work - added to this was the alcohol addictive parents and the senseless loitering in tuk tuks. We certainly had our work cut out for us. Our group decided to teach Mathematics to grade 10 and 11 students - 46 students all together. 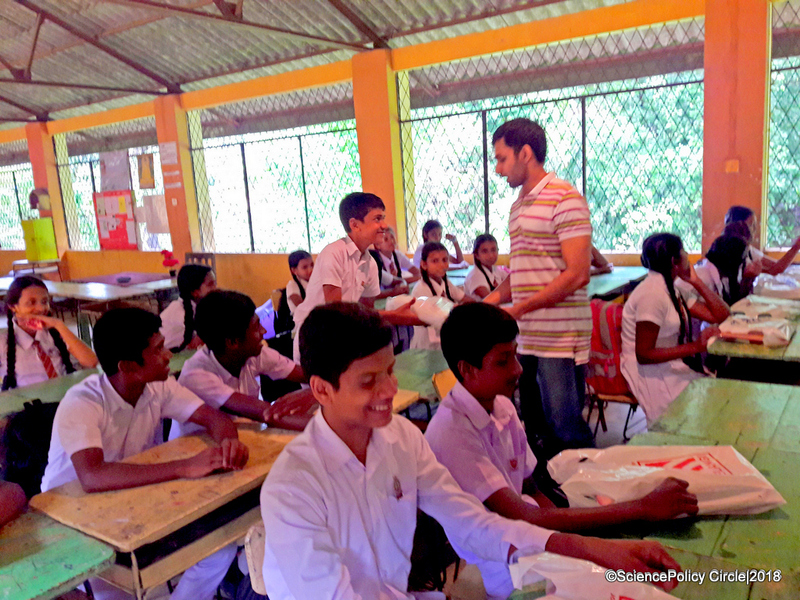 We made the trip to Hinguragalakanda, 123 km up and down, every Saturday and conducted classes from 9am- 2pm. The results from the initial assessment test showed us that most students had trouble with basic Mathematics – EVEN TO ADD 2 NUMBERS! Our biggest hurdle was to find the correct approach to motivate the students to take an interest in Mathematics and to get them to attend the classes regularly. We broke the ice by playing small games and talking about their lives - so we built confidence among the students. We talked about the great achievements of famous personalities, about current events and the many different fields of work available to choose from, all with the goal of motivating them to at least to try. We tried out several teaching methods and eventually the students were divided up in to groups based on their knowledge level. There were many unforeseen obstacles - The school was affected by the floods during May and the classes were halted for 6 weeks, to exacerbate the situation - but we persevered with our goal in mind. It took time, but the change was visible. Slowly but surely, the students gained confidence, solving one problem at a time. Students started to help each other and to complete their homework and past papers eagerly. They understood that we truly cared about them. It mattered to them that they mattered to us. Finally all that hard work paid off. 13 students from the 15 that sat for O/L examination last December, passed mathematics, and we even managed two A-passes! The following graph indicated the improvement of these students - marks of the grade 10 final term test against the final grade of O/L exam. The improvement was immense – it is evident that there were only 2 students who could pass the exam by the time we started, but with collective effort 13 students passed making everyone ecstatic. Dilanka, who was the most inspirational student, managed to convert his 21 marks (W) to a Distinction (A) at the end. Undoubtedly, this was the best sense of achievement my friends and I had ever felt. The concept was so simple, but it changed these children’s trajectory in life. Our little project had actually made a change. It was evident that the best way to educate children was to be deeply engaged in their lives and by providing sincere motivation - widening their perspective rather than providing materials. While well-intended, donating books, computers etc make little impact on a child’s education than building their confidence and the sense of belongingness. Quality education is the greatest gift one can bestow upon a child. AKURU will continue to dabble in teaching and go forward with a strong resolve to be a part of the change that this country needs. Let’s be the heroes we always wanted to be. Let’s change few lives by sharing our time and knowledge. Let’s matter to ourselves and to the world. Why don’t you join us? Spend a Saturday with some kids and have a joyful and meaningful time. Give us a call. Lets be part of the change we always wanted to do.